Sometimes, you just need to create BIG and so I did over the weekend. Not awfully big, mind you ... just sorta-kinda-maybe-big with an 11 x 14 canvas. The inspiration came from the rose images on a napkin. The background started with drywall patching tape, Crafter's Workshop Doodling Stencil and Liquitex Modeling Paste, a wallpaper fabric sheet (a 4x6 pad of 50+ variety sheets found for $2.97 in the clearance section at Joann's), and then acrylic paint (in several pink as well as green values) and gesso blended over all. The napkin tissue was decoupaged next. 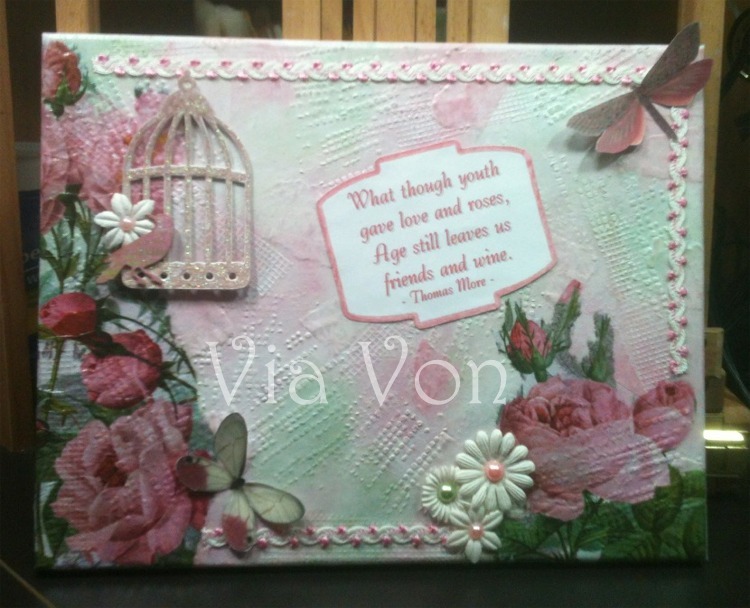 The birdcage was diecut with my Cuttlebug and then gesso'd and painted light pink, then glittered with a soft pink glitter. The bird was a store-bought embellishment that came on a sheet of 8. I printed on cardstock my butterfly embellishments (images from the Graphics Fairy, linked at the right) and printed the quote box which I did in my graphics program. Finishing touches include the decorative sticky trim, stamping ink, Prima flowers and pearl flatback gems. Age still leaves us friends and wine." This really big (to me it is!) canvas is absolutely gorgeous! I love how much texture your "underpinnings" have given the roses. And, your quote is quite thought provoking at this point in my life! Nicely done, Von! MAGNIFICENT Von! I'm so happy you posted ur blog on FB so I could find u and follow....love what you do and seeing it makes me feel closer to your heart...now if only I could give you big gentle hugs.